It takes a lot to overshadow Republic Airways Holdings, but SkyWest managed to do just that yesterday as it literally stepped on RJET’s second quarter conference call when it announced not only its second quarter profits but its acquisition of ExpressJet Airlines (XJT). SkyWest Inc Executive Vice President and CFO Brad Rich said the acquisition and merger with SkyWest subsidiary Atlantic Southeast Airlines (ASA) means SkyWest Inc will be the largest provider to the nation’s two largest carriers – Delta and the combined United-Continental entity. SkyWest made a similar run at ExpressJet in 2008, but noted the price was much more attractive this time around. Rich indicated there were issues between Continental and ExpressJet that were out of SkyWest’s control during that last effort and the current deal is quite different. SkyWest will acquire the Houston-based carrier for USD133 million in cash with SkyWest’s existing cash reserves at USD6.75 per share and merge it into its Atlantic Southeast operations, adding Continental Express to its portfolio. SkyWest retains the USD96 million of XJT’s cash balance including restricted cash. “We have been anxious and looking forward to a relationship with Continental and have been watching ExpressJet for a long time,” he said. “We saw an opportunity to re-engage and negotiate what we think is a very fair contract and get the transaction we think will work.” He added it was a very tight merger agreement. "We believe this transaction provides a significant premium over ExpressJet's current market price for its stockholders and that the combined airline will be able to provide a stable, platform for growth for ExpressJet employees after this transaction closes," said ExpressJet Board Chair George Bravante. Shares of XJT doubled after the announcement but had been trading about USD2.50 during July. SkyWest shares rose 3.5% after the announcement. 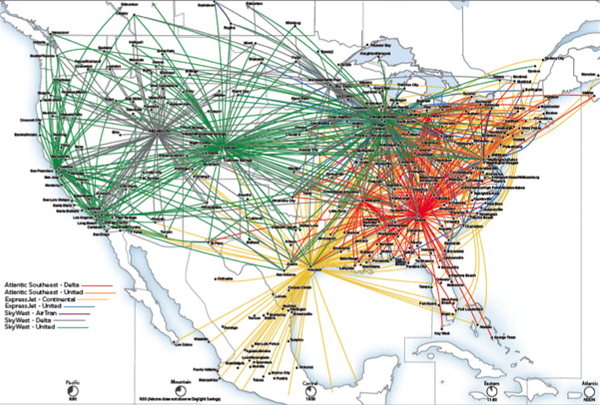 Subject to antitrust approval, SkyWest is confident of gaining such approvals by year’s end since the ASA and XJT networks are largely complementary. Rich reported that XJT clients United and Continental have already signed on to the deal, although it is not contingent on their merger, nor is their approval necessary. The deal provides additional stability – to ExpressJet clients and employees alike – to what has been considered a shaky airline for a long time. Indeed, the move for ExpressJet basically answers the complaint of Edmunds White Partners Jon Evans, who, during the company’s first quarter conference call, wished the company would just close. ExpressJet has been struggling since executives bought the operation from Continental and later decided to use a portion of its fleet for a point-to-point independent operation which closed in the wake of spiraling fuel costs; hopefully putting paid to any further attempts by regionals to break out of their capacity purchase mold. “These integration savings should be measured against a total starting cost base of approximately USD760 million per year for ExpressJet, and against USD1.3 billion for the combined ASA/ExpressJet (not including fuel and aircraft lease/ownership costs),” said Rich. ExpressJet reported USD735 million in operating expenses for 2009. Why ExpressJet, Rich was asked. “First, it was made possible because of the quality of the operations and the dedication of its front line employees,” he said. “There is no way this transaction is a fixer upper from an operational standpoint. This is a highly respected, high quality operation and it fits with our quality commitment at ASA and SkyWest. This is an important day in history of the company. While ExpressJet will maintain a significant operational presence at Houston, headquarters will be consolidated with ASA in Atlanta. Bravante indicated that in addition to the hubs at Houston, Newark/New York and Cleveland there will be operations at hubs in Chicago O'Hare and Washington Dulles for United Airlines. In addition, it is expected that the vast majority of front-line employee positions will not be impacted by the acquisition. The Boards of Directors of both companies unanimously approved the definitive merger agreement. The transaction is not subject to a financing condition, but is subject to approval by ExpressJet stockholders. XJT will be merged into ASA on an aggressive schedule of 12-18 months after closing, but Rich indicated the company is shooting for a 12- to 14-month target. SkyWest has already negotiated a new capacity purchase agreement with Continental which will become effective with the consummation of the acquisition. The new CPA capitalises on the economies of scale SkyWest Inc offers in purchasing and other areas which reduces the cost of providing the service over what ExpressJet could do on its on, he said in discussing the move with analysts yesterday. The new agreement includes the current CPA fleet of 206 XJT Embraer 145 aircraft for a 10-year term with five years of rate protection and a 2015 rate reset. The scheduled reduction of XJT’s fleet to 190 aircraft goes away with the new deal, according to Vice President Finance and Treasurer Mike Kraupp, who added that the Continental Express fleet could grow to 221 since the new agreement allows for 15 additional growth aircraft to be added during the term of the contract. It also includes the ability to replace 75 aircraft, likely with larger regional jets should Continental obtain scope relief from pilots or, perhaps the Q400, if it does not, as rival Pinnacle is banking on with its large Q400 orders. In addition to the increased stability of one of its Express partners, Continental gets a continuation of favorable regional pricing and service quality, improved counterparty risk with SkyWest replacing undercapitalized ExpressJet. SkyWest also has the ability to acquire next generation regional aircraft not only on optimal terms, compared to XJT, but shift the burden of ownership from Continental – which owns XJT’s Embraer fleet – to SkyWest as the St. George-based carrier has done with its other major clients. Rich boasted SkyWest having the best balance sheet in the industry, with approximately $800 million of cash post-deal. The acquisition is not unexpected at all considering SkyWest’s penchant for growing by acquisition in its quest to expand its client portfolio, as well as the continuing struggle of ExpressJet as an independent operator. In response to a question as to whether the company was no longer in the market for further acquisitions, Rich said the company will look at other opportunities. “We could handle more on the SkyWest side,” he said. “We are aggressively pursuing a number of opportunities on that side – other acquisition opportunities and organic growth opportunities. We are looking at opportunities all the time. The issue here is opportunities that would generate shareholder value and employee stability.” He also noted that SkyWest will continue buying back shares as part of its already-approved share repurchase program in addition to pursuing other opportunities. The merger combines ASA’s fleet of Bombardier regional jets with XJT’s fleet of 244 Embraer 145s and makes SkyWest the largest worldwide operator for both manufacturers, said Rich. ExpressJet began flying as a United Express in the fourth quarter, expanding its fixed-fee portfolio for the first time with short term contracts for 32 aircraft. Rich called that an interesting dynamic with an unknown impact from the pending UA/CO merger. He noted 10 aircraft expire at the end of the year and discussions were under way between ExpressJet and Continental as to whether there will be any extensions. “We’ve left it up to the Continental and ExpressJet management,” he said. ASA added a United Express operation at Dulles as its first diversification recently as well. Six of ExpressJet’s aircraft are currently dedicated to charter operations while 206 are devoted to its fixed-fee operations as a Continental Express. It also combines ASA’s Delta Connection and United Express operations with ExpressJet’s Continental and United express operations. 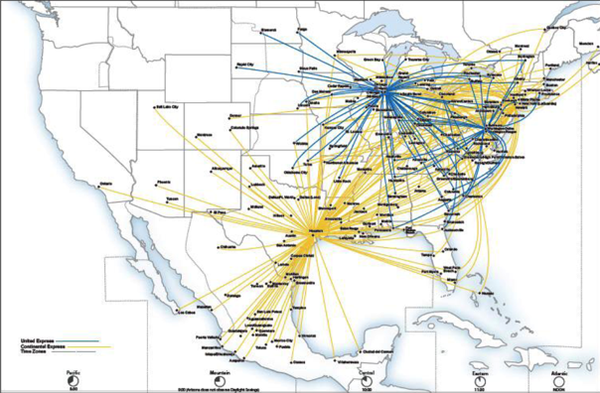 XJT is Continental’s largest Express operator at Houston, Newark and Cleveland – Continental’s fortress hubs – increasing its appeal to SkyWest. In addition, ASA will retain all United and Continental flying – 86% of XJT’s business – as well as all XJT crew bases. However, its corporate jet operation – worth USD56 million in 2009, up 42.4% from the year-ago period – and all other operational centers remain under review. There will be no change to management at either SkyWest or ASA airlines or SkyWest Inc and ASA COO Brad Holt will be adding XJT integration and oversight to his ASA duties. ExpressJet reports its second quarter earnings next week. In the first quarter it increased its net loss year on year 41.4% to USD16.1 million. For 2009 it narrowed its net loss to USD3.3 million, down 96.5% on operating revenues of USD688.2 million, a decline of 47.8% from the year-ago period. As with ASA, XJT pilots are represented by the Air Line Pilots Association, but there are no other employee work groups unionised at ASA, largely owing to SkyWest’s dedication to helping employees share in the benefits of a successful company. Indeed, its stock buybacks are specifically designed to mitigate the diluting impact of its generous employee equity plan. XJT’s pilot contract becomes amendable in December. The Teamsters represent its 900 mechanics while the Transport Workers represent 100 dispatchers. The International Association of Machinists represents it 1,000 flight attendants. SkyWest is a prime target for unions having staved off several attempts over the years. However, the new National Mediation Board ruling allowing a majority of those voting to determine the success of a unionisation effort puts that under threat. SkyWest Airlines President Chip Childs noted pilots are coming in saying they dislike the new ruling with his response being that if they don’t like it they must make sure to vote. He also pointed out the imbalance of the NMB decision noting that while it makes it easier to vote a union in, it did not change the rules on voting a union out. The acquisition is a typical move for the St George, UT-based SkyWest since it has strategically grown through acquisition for its entire 38-year history. Its last acquisition was ASA, acquired from Delta in 2005. It has already invested in Trip airlines in Brazil and is working on a USD7 million investment in a new Vietnamese start up – Air Mekong. Many of ASA’s top managers are already in country providing airline start up guidance for the new entrant. The investment is the second international venture for SkyWest having invested USD30 million in Brazil’s Trip for 20% ownership. Kraupp cited different ownership laws for the difference of USD7 million for a 30% ownership in the Vietnamese new venture. Kraupp responded to a question about how SkyWest would protect itself from what happened to Mesa in its joint venture with Shenzhen and Kunpeng Airlines. Mesa invested millions and placed five of a number of CRJ200s there before being told Kunpeng not only did not want its aircraft but basically kicked the US carrier out of the deal. Subsidiary Atlantic Southeast Airlines will acquire all of the outstanding shares of common stock of ExpressJet Holdings, Inc. for USD6.75 per share in cash, representing a net purchase price of approximately USD133 million after accounting for the shares already owned by Atlantic Southeast. Upon completion of the merger, ExpressJet will become a wholly-owned subsidiary of Atlantic Southeast, with the intention of combining the operations of ExpressJet Airlines and Atlantic Southeast, subject to receipt of necessary regulatory approvals. The parties anticipate that both airlines will continue to operate under separate airline operating certificates until the regulatory process can be completed for combining the airlines under a single operating certificate. Pending receipt of that single operating certificate, Atlantic Southeast intends to transition certain existing ExpressJet support functions to Atlantic Southeast and SkyWest. The company expects to benefit from greater efficiencies of scale and capitalising on growth opportunities as contracts covering 500 regional jets expire between now and 2016. "We are extremely pleased to reach this definitive merger agreement with ExpressJet and look forward to the consummation of the transaction," said Rich. "We also look forward to the integration of these two successful airlines and employee work groups and hope to create integration benefits that will solidify the long-term future of each of these airlines in a very competitive industry," he continued. Raymond James & Associates were the investment bankers for the deal, while Parr Brown Gee and Loveless were legal advisors. Oliver Wyman is working on the post-merger integration plan.